Home » Lips » Lipstick » Day 3 : Lancome L’Absolu Rouge Star Pick! Day 3 : Lancome L’Absolu Rouge Star Pick! Day 3 of the 30 lipsticks in 30 days project and we have a star pick of Lancome lippies. 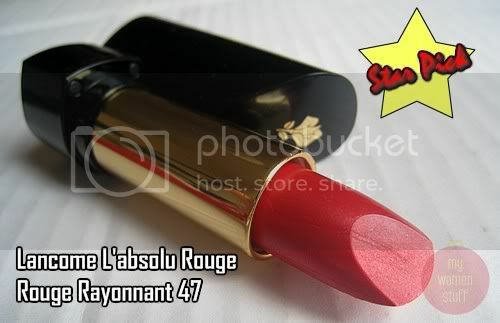 It has to be Lancome’s L’absolu Rouge a new and revamped line of lipsticks from Lancome Cosmetics. The color I have is Rouge Rayonnant 47 which is a gorgeous rose-red colour with slight warm gold tones. The texture of the lipstick is smooth and creamy, just sliding onto my lips like satin. Lancome says its from its pro-xylene technology. I just say that its an awesome lipstick that gives you lovely colour. Pigment is strong yet it goes on a little sheer at first. You can actually build up the colour to look just like it does in the tube. I use this day and night – for the day, its just 1 or 2 swipes and for night, I build it up for intensity. Despite the strong color (its stronger in real life), the texture is still surprisingly creamy and moisturizing and it contains SPF for those who’d like that. I’m making this one my Lancome star pick! In the picture below, its just 2 swipes for a day look. Still pretty bright eh? Day 4 will feature Chanel Infrarouge in Matador so come back then! Oh this one’s quite different 🙂 But glad you found something that might work. hey, not fair. pick something that’s not red! i can’t wear red even though you said i should try this. no way! i have tried toooooooooooo many. just no red for me. LOL… I’d try for the next week. Thanks for the gloss tip. I have so many lippies in the same shade but there’ll always be something that sets one apart from the others as I’m sure you’d have found. I might check out the colour you bought. Sounds like a challenging color for me! And my 2nd love is Lancome brand after Estee Lauder..err….3rd actually, cos there’s Stila sharing top place with Estee. 😉 Thank God, we can’t get NYX here. But #47 is really a pretty color. Like the gold undertone to it which actually shows up quite nice on your lips. Haha… time to hit up Lancome then! One swipe is pretty sheer and you can top it up with gloss for quite a pretty casual look 🙂 Thanks for following this series! wow… i like it on ur lips.. so kissable.. perfect! Lancome is a brand that i rarely look at(it feel old! no offense!) but this look very promising, it work nice! maybe i can start with a lipstick! I love red lipstick. This shade looks fab on you. Thank you and thanks for dropping by too!